What do people look for when they are deciding which market research company to choose? In a recent survey we carried out of corporate organisations that commission business to business market research surveys (many of them also commission B2C surveys) we posed the question – Assuming you have a need for a market research supplier within the next 12 months, what are the most important attributes you would look for? Respondents were given a list of attributes to consider. Most of the results were as expected. Experience is critically important. Not just experience in business to business markets but experience in specific industry verticals. Business to business companies know that their markets are complex and they don’t want to commission someone who needs to spend time on the learning curve. 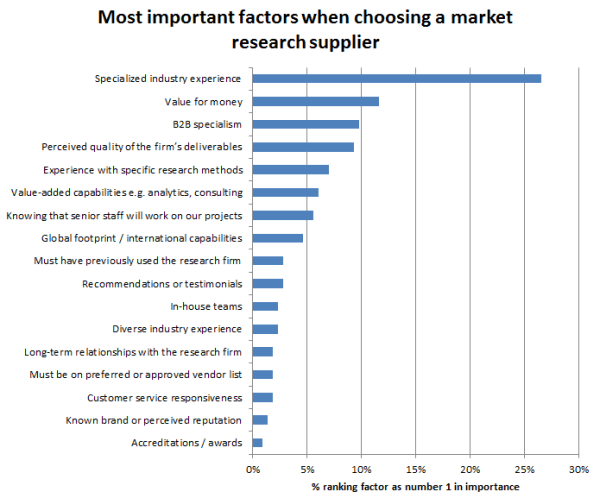 Over a quarter of companies said that specialist industry experience is the number one factor that drives their choice of market research supplier. It received twice as many nominations as the next most important factor. Not surprisingly, value for money is near the top. In fact, it was ranked the second most important factor. It is not that people are looking for the lowest price; they want quality as there is no point in the research unless it is absolutely believable. This means that value added capabilities such as analytics and consulting are becoming more and more important. It was interesting for us to note that the 215 corporate organisations we interviewed did not rate the brand of the market research company to be of critical importance. Nor did they feel that they have to have a long-term relationship with the research firm. If the researchers have got the experience to do a great job, they are in with a chance as long as the price is right. Thank you to all the contributors to the survey – we have taken this on board.